"The Shard" is a colloquial name for the London Bridge Tower. It is essentially a pyramid of glass that stands at the southern terminus of London Bridge. With a completion date of 2012 it has already been recognised as the tallest building in the European Union. The Shard was designed by famed architect Renzo Piano in conjunction with Broadway Malyan. Piano started the design in 2000 under contract by Irvine Sellar. Sellar is a property developer in London that was intent on redeveloping the Southwark Towers that once inhabited the space upon which the Shard now stands. Piano is most famous for designing the famous Pompidou Centre in Paris, France. The term "The Shard" came about due to the semblance of the building to a shard of glass stabbing out of the ground. Renzo Piano was intent on creating a design that stood out against the London skyline without attempting to be too overbearing or indelicate. It was designed to use specialised windows with a specific glazing that reflects light in a distinctive way. The glaze would reflect different intensities of light in ways that would change the appearance of the building during different seasons or times of day. The design currently under construction was altered significantly after the fall of the World Trade Center in the September 11, 2001 terrorist attacks on New York City. The Shard was one of the first buildings to incorporate the new structural standards recommended by the US National Institute of Standards and Technology after 9/11. Construction didn't begin until February of 2009. Three enormous cranes were erected and used to complete construction of the building. For the bulk of the initial construction, the structure raised by a steady 10 feet per day. The first glass panels were installed before the building even reached its terminal height. The Shard reached this terminal height of nearly 1000 feet in 2012. The building is essentially a glass spire surrounding an internal column of concrete. 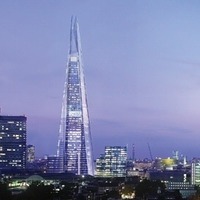 The design for the Shard was commissioned by real estate developer Irvine Sellar of the Sellar Property Group. Sellar went to Berlin in 2000 to have a lunch meeting with architect Renzo Piano to go over ideas for the building. Renzo was initially very opposed to the idea of a building of this size in London. The initial designs he created for the building were strongly opposed by a number of local authorities, and that forced him to re-imagine his design. The redesign turned into the Shard's current design. The Shard is a multiple-use structure. Floors 2-28 are office space rental areas. The 31st, 32nd, and 33rd floors are all dedicated to restaurants. The Shangri-La Hotel takes up the 34th through the 52nd floor, and is a five star hotel. Residential apartments are between floors 53 and 65. There is also an observatory between the 68th and 72nd floors. There is a spire that runs from the 72nd floor to the very top. The closest London Underground Stations to the Shard Building are London Bridge, Borough, Monument, Tower Hill, Bank and Southwark.